The IndieVice™ is the world’s first universal Smart Body for The Smart Phone. The IndieVice is now also fully compatible with smartphones such as the iPhone 7 Plus dual camera system. By simply inserting your smartphone into the IndieVice™, you instantly have a pro rig camera that fully utilizes the potential of your smartphone and other mobile camera devices such as the GoPro. With zoom-in/zoom-out bluetooth technology, glare-deflector, a comfortable eye-piece, flip screen technology, a universal accessory mount, a universal lens adapter, and all sorts of other add-ons, the IndieVice™ will take shooting with your smartphone to a whole new level. LOOK AND SHOOT LIKE A PRO WITH YOUR SMARTPHONE COUPLED WITH THE INDIEVICE™. Whether you simply want quality videos and photos for your personal use, or are producing professional calibre independent films, journalism, wedding videos, or travel photography, the IndieVice™ makes it super easy. Its ergonomic body design ensures comfortable shooting, even after hours of use. And, the best part of using the IndieVice™ is that you don’t have any downloads, transfers or wifi uploads. You can now shoot, edit, and post, all from your smartphone. The IndieVice™ allows you to keep a simple production workflow. If you have an iPhone, no problem. If you have an Android, perfect! Shoot 4K video with your Sony. The IndieVice™ will make it tough for you to put it down. Be prepared to enter a new world, one where you have complete control. No cables. No wifi chip enabled memory stick. No transfers. Just shoot, edit, and post. Make productions faster, easier, and more professional. 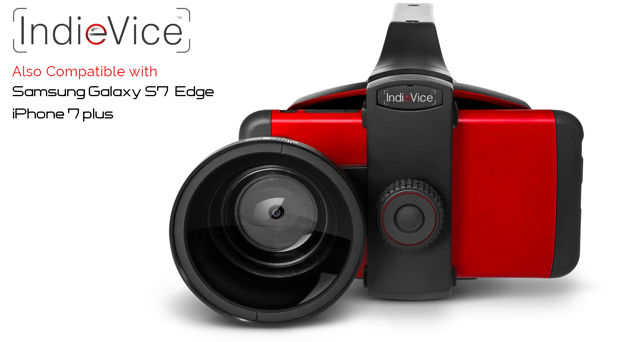 The IndieVice™, bringing the filming and photography power of the smartphone to the professional arena.